Collector Series Editions & More…. Now you can experience the closest thing to one of my original paintings in look and feel without the cost of investing in an original artwork. Keep in mind that these are still very special creations of the highest quality, and limited in quantity for exclusivity. If you’ve been watching my Blog posts and get my email newsletters you may already know that I’ve been working diligently in the studio to create awesome fine art collectables of my paintings. These high quality limited-edition reproductions are created on the finest archival medium so they’ll last a lifetime – ready to display in your home. Reproductions in this medium will look as great 50 years from now as they do today. Most editions include an exclusive limited version exactly the same size as the original painting often featuring my model/muse portrayed life-size and sometimes larger than life. In many of my series we’re also offering a couple smaller versions to accommodate your space and budget. Limited edition series are signed and numbered by the artist and ship complete with a full color Certificate of Authenticity. Each is created with advanced print technology to accurately reproduce all the beautifully saturated color, depth and detail of my original art. The result is a collector’s quality fine art print that we can all be proud of. Ready to hang and enjoy – complete with wire and felt pads, each is inspected for quality and signed by the artist. And they’re only available here. 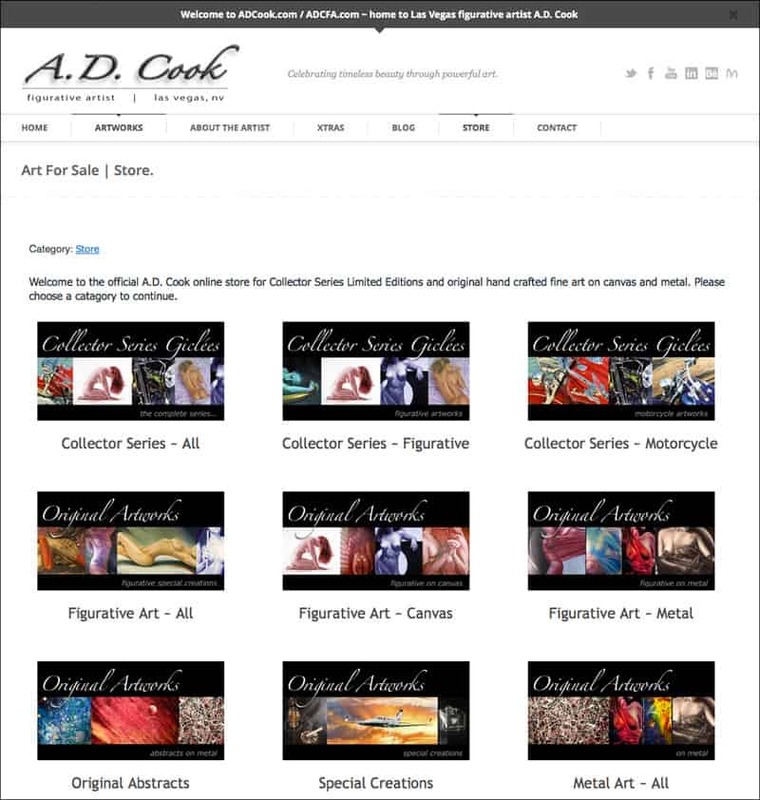 To protect you from any risk of fraud, particularly relating to counterfeits, no official retailer sells my artworks on the Internet. They’re available exclusively from ADCook.com / ADCFA.com. So whether you are a fan of my figurative creations or my motorcycle series, I’m sure you’ll find something exciting for your walls. Order early for the holidays. Edition prices are subject to increase as art editions sell out. Stay tuned as other A.D. Cook artworks will be offered soon. Giclée (pronounced “zhee-klay”) – The French word “Giclée” is a feminine noun that means to spray, and in regards to ink jet technology applies to ink sprayed onto the canvas’ surface. The term “Giclée print” connotes an elevation in printmaking technology. Images are generated from high resolution digital scans and printed with archival quality inks onto canvas. The Giclée printing process provides better color accuracy than other means of reproduction. My Giclée reproduction are created using large high-end professional ink-jet printers. These modern technology printers are capable of producing incredibly detailed prints for fine art collectors. The quality of my Giclée reproductions rival those commonly found in museums, art galleries, and photographic galleries.